The Catalan Water Agency (ACA) established a WFD Monitoring Programme for a period of 6 years (from 2007 to 2012) in order to provide a proper water status diagnosis just before the water management plan’s updating in the Catalan River Basin District (NE Spain). Most of applied monitoring tools were developed over the last decade in close cooperation with research centres and universities in order to assure they are WFD compliant. Thus, novel methods arose and have been published in research papers over the last decade providing new tools for water quality monitoring and bioassessment in Mediterranean WB. Using all this experience, a comprehensive monitoring network has been established by the ACA to provide a coherent overview of both ecological and chemical status for surface waters and chemical and quantitative status for groundwater. Therefore, chemical and ecological status were assessed in rivers (248 WB), lakes and wetlands (27 WB), reservoirs (13 WB), transitional waters (26 WB), coastal waters (33 WB), and groundwater (37 WB). A total of 137 out of 384 WB were classified as good status (36%), whereas 221 (58%) were classified as bad. However, some uncertainties were found when applying the monitoring program which raised some concerns in the way of quality assessment and ecological status classification. A total of 59 (15%) WB classified as good and 107 (28%) WB classified as bad showed uncertainties when classifying between good and bad quality status, and quality status could not be finally assessed in 25 (6%) WB (temporary WB) due to difficulties found applying current protocols. Uncertainties have been highlighted in order to be solved near future. 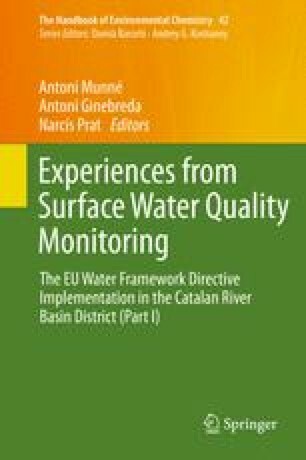 We really appreciate all collaborative contributions from research centres and universities which have been closely involved to improve monitoring procedures and quality status assessment in the Catalan basins (see all chapters published in this volume and volume II). Special thanks to Catalan Water Agency’s technicians (Carolina Solà, Lluís Tirapu, Mònica Bardina, Evelyn Garcia, Mònica Flo, Mercè Figueras, Anna Terrats, Xavier Fusté, Carme Serena, Josep Fraile, Teresa Garrido, Xavier Carreras, Núria Micola, Javier Torrijos, Mariona Torres, Marta Manzanera, Maria J. Cardell, Maria J. Corrales, Josep Vilagrasa, Elisenda Gonzalez, Fidel Picó, Marta Endrino), who have been deeply involved carrying out the monitoring program in Catalan basins. Also thanks to people who works in the Catalan Water Agency’s laboratory and GIS technicians and IT operators who assure databases and producing maps on water status.